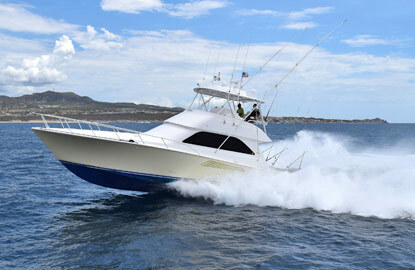 This immaculate vessel is the latest addition to the fleet and is already receiving rave reviews with its pale yellow hull and top of the line electronics this vessel is designed for both the serious professional fisherman and for those seeking the best in comfort. Twin 2200 HP Mann engines provide a top speed of 43 knots; electronic trolling valves are a nice feature. The spacious cockpit provides mezzanine seating and ideal spot to be first in the fighting chair or to observe the fishing action up close. 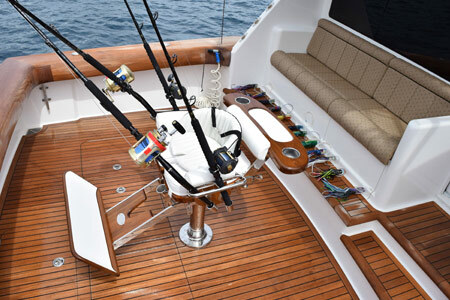 Cockpit has recessed fish box and freezer, Rupp outriggers, professional fighting chair, large live bait well, ice machine, tackle and bait center with extensive assortment of trolling lures and teak deck. The interior is finished in hi gloss cherry wood with full air conditioning throughout. The salon is clean and uncluttered and has an �L� shaped couch arrangement, dinette, 42 inch plasma TV and entertainment center, cigar humidor and tasteful decorative accents. Galley has Sub-zero refrigerator and freezer drawers, convection microwave and garbage disposal. Three comfortable staterooms and two bathrooms, washer and dryer; carpeted throughout. The fly bridge has ample shaded seating for guests and is equipped with Northstar 972 GPS Plotter, Furuno RD30 digital depth/surface temperature, Furuno 1200 bottom machine, and Simrad radar and auto pilot. Full complement of tackle ranging from 20 to 80 LBS along with electronic teaser reels. To maintain the standard and integrity of this vessel, optimum group size is four anglers, though exceptions can occasionally be made. Captain Benito Agundez is an originally from La Ribera on the East Cape, he has been with Pisces for over 25 years. He brings skill, dedication and professionalism to this boat. He speaks good English and his deckhand Ray works hard to keep the boat in top shape � he has sharp eyes that are always on the lookout for fish. Includes: Ice, crew, fuel, tackle, 10 live bait (subject to availability), box lunches, 24 beverages, coffee and sweet rolls before departure, freezing and filleting of catch. Includes: Vessel, fuel, tackle, crew, sweet rolls and coffee before departure, box lunch per person, 18 beverages (bottled water, soda, Mexican beer), 10 pieces of live boat (subject to availability), filleting and freezing of your catch. Includes: Vessel, fuel, crew, snacks, beverages (bottled water, soda, Mexican beer), open bar or consumption per bottle is available for extra charge.